The Department of Information and Communications Technology (DICT) said it is collaborating with the Department of the Interior and Local Government (DILG) for a draft executive order that will require local government units to issue cellsite permit to mobile operators within seven days. 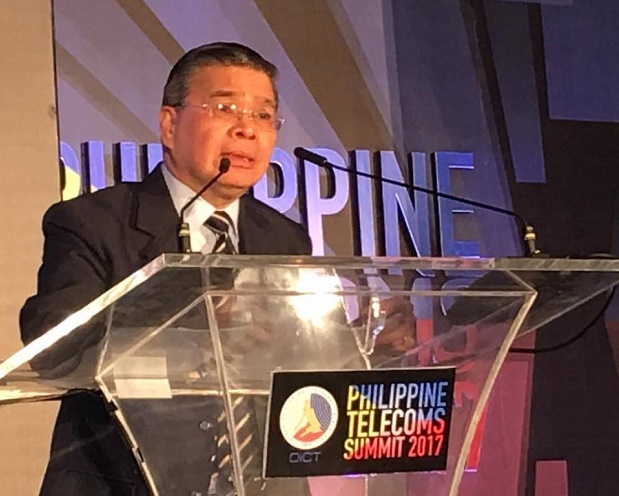 DICT secretary Rodolfo Salalima disclosed this at the ongoing Philippines Telecom Summit at the PICC Tent, warning that LGUs who would delay the issuance of the permits without acceptable reason will be charged before the Office of the Ombudsman. Salalima said the move is meant to address the persistent complaints from subscribers on slow Internet speed because of the lack of cellsites in the country. Compared to Vietnam which have 40,000 cell towers, the Philippines has on 7,000 cellsites. Local telcos Globe Telecom and Smart Communications have argued that their deployment of cellsites around the country has been hampered by the 25 permits that they need to obtain from the LGUs over a long period of time, which normally extends up to 68 days. It takes another two to three months to actually construct the towers, prolonging the implementation even further, they said. Under the EO that will be submitted to Pres. Rodrigo Duterte for signing, two more days may be given for the local chief executive to decide whether to approve or deny a permit, but if after that no decision has been made, the permit should be deemed approved. Salalima said he is confident that if this recommendation is followed, the Philippines will be looking at improvements on the telecom services after just six months. "If they don't do that and they will delay it without justifiable reason, we will bring the appropriate charges against them in the Ombudsman," Salalima said, admitting that some LGUs are profiting from the delay of the issuance of permits. On the other hand, DILG assistant secretary RJ Echiverri said the telcos must report to the DILG the LGUs who will deliberately hold up the release of the permits. "We will coordinate with the DICT and file the necessary charges at the Ombudsman," said Echiverri. Also, Globe senior executive Gil Genio suggested that the Philippines adopt the US policy that forbids LGUs and subdivision owners from refusing to allow the installation of cellsites in their respective areas. At the event, National Telecommunications Commission (NTC) chief Gamaliel Cordoba showed a list of posh villages and subdivisions which have refused to give permission to mobile operators to put up cell towers inside their territories. Aside from the refusal of homeowners of subdivisions, Cordoba said the problem of right-of-way in public roads and highways is also a major hindrance.